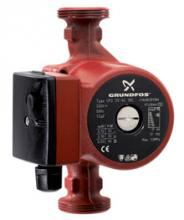 Applications: The circulator pumps in cast iron pump housing version are specifically designed for heating systems. For under-floor heating systems, it is advisable to use the bronze version, type ALPHA+ B and UPS B, as the pumped liquid may often become aerated causing an ordinary cast iron pump housing to corrode. ALPHA+ automatically controls the different pressure by adjustment of pump performance to the actual heating demand without the use of external components. The ALPHA+ and UPS pumps are of the canned rotor type, i.e. pump and motor form an integral unit without shaft seal and with only 2 gaskets for sealing. The bearings are lubricated by the pumped liquid.